Chris and Danika, the couple who are famous for quit their jobs, sold everything in San Francisco - all to travel the world. During the trip around our world , they visited Vietnam , spent 3 weeks to go from north to south , visited some big cities such as Hanoi , Halong , Hue , Hoi An , Ho Chi Minh City and the West. Not only go sightseeing beautiful places , they also have a food tour eveywhere they go to enjoy the characteristic taste of each region . I love the creative ingredients, and that mix of sweet, sour and spicy flavors. No matter where we went, we were able to find vietnamese staples like Pho and Bun Cha, but we were surprised by the variation from one city to another. We felt lucky that over the course of three weeks, we'd have the chance to try the food from so many different parts of the country so we can feel this flair and distinction. The Pho you order in Hanoi is almost completely different from the Pho you'll get in Saigon. 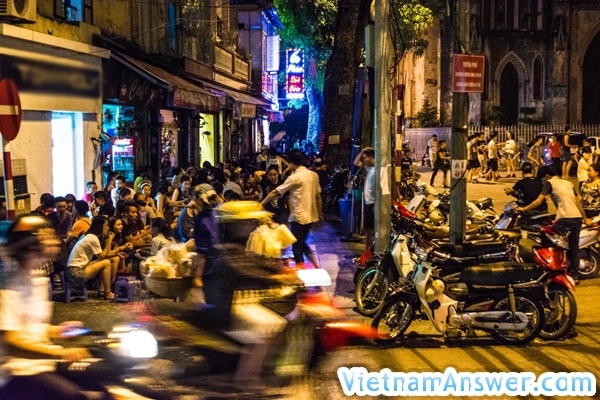 In Hanoi, the north of Vietnam, the places we ate were basically street food stalls. In the central region of Vietnam, things were a little more developed, and we found a broader selection of traditional restaurants. In Saigon, Vietnam's largest city, we were able to find everything from amazing street food to fine dining all on the same street. We realized that eating in traditional Vietnam restaurants is very different from eating in restaurants in Europe and America . Be adventurous: Many restaurants in Vietnam (especially Hanoi) don't always look like traditional restaurants in the US or Europe. Sometimes, the "restaurant" is the front room of someone's house, and they serve food to you in what is essentially their living room. Sometimes the "restaurant" is just a grill setup over an open fire on the sidewalk. If you see people sitting on little plastic stools, go ahead and order a meal like them, and had amazing meals. 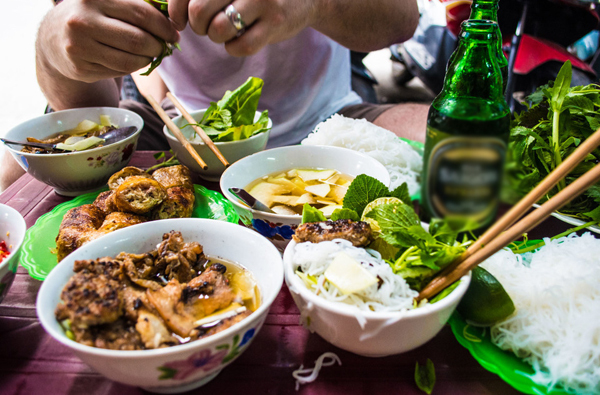 Learn from locals: This golden rule of eating in a foreign city applies anywhere, but especially for Vietnam. If you look into a place and see nothing but wide eyed westerners looking back at you, run away. Often times this tactic does mean that you will end up going into places that may appear to be less than "100% sanitary", and they most likely will not have a translated menu for you. Find someone who is eating something that looks good and point to it when you order. Odds are you'll get delicious, authentic food, and for a fraction of what you'd pay in a restaurant that caters to foreigners. Don't always expect to get a menu: Many places we ate in Vietnam only served 1 dish. You basically walk up, grab a stool, and within 30 seconds someone walks over and puts down a bowl or plate of what ever it is that restaurant makes. It could be skewers, bun cha, pho, or something. It's hot in Vietnam, and nothing helps cool you down like a glass of beer. sidewalk and drank a few bottles. Bun thit nuong cha gio, Pho, Ice coffe. When she lived in Shanghai, a group of my friends would go out on these “pho-missions” to search for the best pho in the city, inevitably hitting up shops with names like “Phở Thật” and “Đệ Nhất Phở.” She never understood the craze — until she got to Vietnam. The bowls of Pho in Saigon was amazing enough, but then we go to Hanoi — and she fell in love with pho for breakfast. For the equivalent of a dollar, they got to sit on toddler-sized stools and eat the freshest noodles in a delicately spicy clear broth, with accoutrements of lime, chili, cilantro, and mint. Bun bo is a cold dish featuring rice vermicelli mixed with lettuce, herbs, beef and bean shoots, and sautéed with garlic. Crushed nuts, dried shallots, and thinly sliced pickled papaya and carrot go on top, and a sweet, warm sauce (fish sauce, perhaps) is added last. She has tried several variations of this in Paris, and while it’s easy enough to season the beef and mix the other toppings, she thinks the key is getting the vermicelli right. She love this dish so much, but Edna never got a proper photo of it in Vietnam because she was too eager to dig in. Edna can’t tell the difference between spring rolls and summer rolls and nem and banh cuon and all the other variations in Vietnamese cuisine. But I believe my favorites are the ones known as spring rolls, which are crispy and fried, and usually filled with light meats and vegetables like shrimp and wood ear . Similar to spring rolls , seafood of Vietnam has made Edna confused with their names . During the tour visits Saigon , Edna enjoy crab , steamed clams with chilli , grilled scallops served with roasted peanuts and coriander . Some of the best seafood she has ever had, has been in Vietnam.